Do Not Lend This Book Out- YOU WILL NEVER GET IT BACK!!! Pavel Tsatsouline's landmark classic, Power to the People! has helped tens of thousands—be they world-class athletes or basement enthusiasts—achieve and maintain remarkable strength gains, by employing a set of radically effective lifting principles in a scientific manner. Pavel took the guesswork out of strength training and honed in with an elegant simplicity on what really worked to get stronger—and continue getting stronger. Pavel's great contribution has been to research and identify the proven "battle" strategies that give us the best chance to keep making those strength gains—whatever the odds. And in this, Pavel has succeeded admirably, thanks to his access to the best training secrets not only in the West but in Russia—justly famous for its history of achievement in the world of strength and powerlifting. And thanks to his ability to ground theory in the proof of hard experience and earned results. 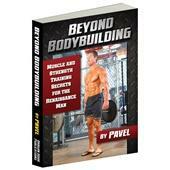 In Power to the People Professional, Pavel broadens and deepens this knowledge base to encompass a vast range of little-known but highly effective methods to keep tricking our stubborn bodies into ever-greater strength gains. Some of the chapters are straightforward coverage of "how they do it in Russia", others represent Pavel's own original work based on years of research and experimentation. How sure are we that Power to the People Professional (paperback) will work for you? Simply fill out the form below and put Power to the People Professional (paperback) to work for you right now. Obviously, we would go out of business if Power to the People Professional (paperback) didn't work, the way we said, right? 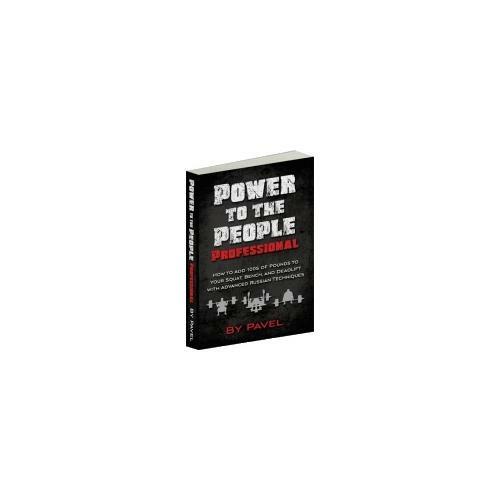 With the promise of a full refund if you're unsatisfied, you have nothing to lose by trying Power to the People Professional (paperback). Go ahead and try it today. 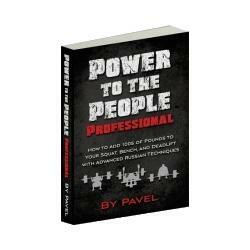 Power to the People Professional is another excellent publication from Pavel. The book contains a wealth of information that will help lifters improve their Squat, Bench, Deadlift and Total. What is refreshing is the no frills approach: everything is written to the point and with no fluff. Advanced lifters must read this book." My thanks for Pavel's Power to the People Professional. Though I am not a powerlifter, I continually run across interesting power lifting tips I can use in my bodybuilding workouts. I was impressed with the article on Vladimir Volkov, the European bench press champion. Reading that he only does bench press in his workout was a stunner but what really caught my attention was his using moderately to heavy weights and never to failure yet he has done a 639 bench press. I'm going to rethink some of my workout routines. Thanks a gain for a great source of training knowledge." A marvelous collection of thoughts ideas and theories by some of the top strength coaches in the world. The book is full of great information." I am thoroughly enthralled with Power to the People Professional. There is real passion in this book and it shines through in the characters that populate PPP: these men come alive as Pavel breathes life into their unique lives and diverse methods. Per usual, Pavel's impassioned pursuit of various strength methodologies is peerless; his gathering of tactical techniques makes this book a strength and power wellspring. There is enough substance and meat and grit between the covers of this book to keep the serious power man busy for the next five years. Highest marks. Excellent on a multitude of levels. This book is a goldmine of tactics and techniques." "Wow. wow, wow, wow! One of Pavel's genius attributes is to take the very complex and state it so simply that anyone can grasp it. He showed us this perfectly in the original Power to the People!, distilling the essence of strength training into a slim manual that became my bible for teaching the basic principles of how to get strong and why they work. Now, with Power to the People Professional, Pavel has written what is sure to become one of THE most revered books in the pantheon of powerlifting guides; right along with Ernie Franz's The Ten Commandments of Powerlifting, Hatfield's The Complete Guide to Powerlifting and the entire works of Louie Simmons. It is a masterpiece of powerlifting information, history, math, physics and biomechanics STILL written in a way that is ultimately understandable. Ostensibly just about advanced Russian Powerlifting techniques Pavel still manages to weave all the concepts, principles and methods in the evolution of powerlifting into the text seamlessly covering the gamut from Paul Anderson to the newest advances in geared training and competition. Nothing is left uncovered! From the smallest detail of wrist position in assistance exercises and weight distribution of the feet in the deadlift, to all the variations of force production choices for the advanced trainee. Brilliant! An instant classic. 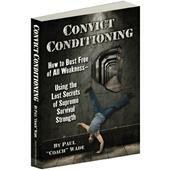 ANYONE interested in powerlifting and competitive strength, or strength at ALL NEEDS to have this book. This will not just be read but STUDIED. Bravo Sir, not only a homerun but a Grandslam." Do You Deserve this Book? In the days before mail-order black belts and instant internet gurus, martial secrets were shared when the teacher considered the student capable and deserving of the new method. The dilettante, the glib seeker of endless new forms, the sly rip-off artist, the slow and the dim-witted—all were ruthlessly weeded away. One in a hundred of the students might have the fortitude and wherewithal to survive and prosper as a martial artist of skill and worth. The fundamental insight behind this strategy is that success comes to those who practice the fundamentals of the art with a dedicated, protracted and consistent intensity. It is the idle amateur who chases the new shiny bauble only to find himself forever marking time on the treadmill of mediocrity. So too in the world of the strength elite. Only the chosen few have the persistence, guts and iron-will focus to master the art of heavy lifting—and to reap the just rewards of that unrelenting labor. Pavel's Power to the People Professional—as the title suggests—contains "forbidden fruit", best served only to those who have earned the right to sample the wares. If you dare and belong—dig in and add hundreds of pounds to your lifts … otherwise, as Pavel warns in his introduction, please "burn before reading". This is a graduate program in getting strong. If the RKC is the "School of Strength," this is the special ops class. Honestly, just pick the book up and pop open a chapter. Here are the programs, the thought process, and the actual systems used to produce stunning lifts in the three powerlifts. I cannot recommend this book highly enough. As my "Must Have" collection of books spirals higher each year, I am comfortable in saying that this book will quietly show the door to one or two of the books on my previous lists. It is that good." Intelligent intensity and total dedication along with stimulating variety is the theme among numerous training strategies featured in Pavel's new Power to the People Professional. Top notch Russian powerlifters, exacting coaches, and meticulous research studies point to strength building schemes that absolutely PRODUCE! Since an original Russian all-rounder, George "the Lion" Hackenschmidt, established long-standing weightlifting records at the turn of LAST century, Pavel's latest compendium of Soviet methods is way past due! Learn to freely borrow from the diversity of detailed systems discussed, and delight to the insight behind their creators' mindsets. Then set aside Pavel's Professional, head directly to the gym with extreme motivation, and follow the lessons toward suggested serious GRINDING!" "I truly enjoyed reading Power To The People Professional by Pavel, it has helped greatly in my own lifting as well as applying certain principles to my players. With each of Pavel's books you come away both philosophically and practically stimulated, this one was no different. I would strongly recommendPower To The People Professional to anyone who lifts weights or works with athletes who train with weights to assist them in sport performance." "Lock yourself up for a few weeks in your garage or basement with a barbell set, some kettlebells and the hard hitting ammo found inside Power to the People Professional and you'll emerge from the shadows stronger, leaner and more powerful than ever before." "Pavel does a great job discussing the powerlifting training techniques of Eastern European athletes. His knowledge of powerlifting, especially when it comes to those athletes in his former neighborhood, and how to train for it, is exceptional. If you want your bench press, squat, and deadlift to go up, listen to him. No argument here: it works and gets results!!" "Pavel's Power to the People Professional is spectacular. The style in which it is written, the information that is presented and the different workouts he features (all from accomplished sources) are all very useful, practical and a must read by anyone desiring to gain more knowledge and also take their training and strength to the next level. Pavel never ceases to amaze me with his fresh and interesting angles on all subjects he tackles. Thanks for another great book Pavel, this goes into my library of resources that will follow me throughout my career". 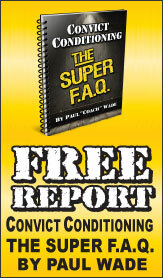 "This is THE definitive book on HULK-like raw grinding strength development! For a powerlifter it is a bible… for a coach like me it is an invaluable treasure chest of knowledge delivered like only Pavel can… Read, apply, lift. Then read and apply again and lift even more! So it can continue forever if you wish! The Viking is happy!" Rated 10/10 Do Not Lend This Book Out- YOU WILL NEVER GET IT BACK!!! Ive been involved in Powerlifting for almost 30 years, both as an International level competitor, USA Team Coach and Sports Journalist. Pavel's new Book POWER TO THE PEOPLE PROFESSIONAL is absolutely the finest compendium of thoughts about our Sport, as seen through the eyes of some of the Greatest Lifters and Coaching minds from Russia. All of these ideas can be used by Powerlifters and athletes alike to simply get big and strong- in a hurry. I urge everyone who takes this sport seriously to buy your own copy soon- but be forewarned: If you lend this great book out, YOU WILL NOT GET IT BACK. 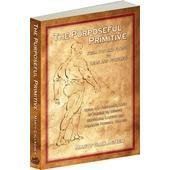 Rated 10/10 PTP-Pro, best book on market for serious lifters! This is without question the BEST powerlifting book on the market with regards to lifters who compete. I competed for about 15 years-winning both state and national drug free and then eventually gear free meets,this book would of cut years off my training and added years to my training, unfortunately for me, i no longer compete. The routines pavel has put in this book can keep any lifter from getting bored, and keep them progressing to their maximum potential. The first PTP took my deadlift without a belt from a bar and 45 on each end to 615 without a belt. I credit that accomplishment to pavel and his methods and advice! "PTP-pro"-only SERIOUS lifters need apply! Rated 10/10 "Honey, have you seen my highlighter?" Got the book yesterday and read it in one sitting(actually standing) as the workmen did my hardwood floors. A Disclaimer to start:I have read just about every classic training text including the Russian translations. I even had my copy of "Supertraining" and a highlighter by my toilet for study and review for 3 years. Happy to lend it out...I am also under the bar familiar with and have practiced almost each of the approaches, techniques, and training philosphies in this book. What this book does, better than any other book I have read, is tie together seemingly contradictory ideas, and shows that training concepts come not on a spectrum but on a full circle. Want to understand why or why not to explode lift? Why are both right, and also wrong? Heel push vs toe slide in the DL? What about train a lift 5 days a week vs once a week? They can't both be right? Yet they are. Why do some people do a lot of assistance and others very little, or why do some folks train the week of a meet and others not at all? Are the WSB and Evil Empire really at odds? You might be surprised at that and much more. What Pavel does as well as anybody in the field is take concepts you would only know the name of if you are in a Phd program or read Supertraining in strange places, and lays them out in easily understandable and useable prose. While a powerlifting book in focus, the themes and concepts you see here are ones you use in any sports strength training. Last night as my wife and I put the books back in our bookcases, she asked if me if i wanted all my training books on two shelves again. All but one. "Honey, have you seen my highlighter?" definitive book on HULK-like raw grinding strength development! I was lucky enough to receive a copy a couple of days before release and I could not put it down! For a powerlifter it is a bible..for a coach like me it is an invaluable treasure chest of knowledge delivered like only Pavel can..
Read, apply, lift. Then read and apply again and lift even more! So it can continue forever if you wish! That's what is says in the introduction. It is meant to be taken as a warning: this book is a collection of ADVANCED powerlifting techniques and strategies. If you aren't an experienced powerliftier or haven't at least read and applied the original Power to the People program, you have no business doing the things in this book. I have often said that Pavel's great talent lies in being able to take extremely complex and difficult subject matter and present it in a way that anyone can understand and apply. The original Power to the People was a book that did just that. This book however, shows us what the complicated subject matter is. Going deep into various techniques to improve your lifts, periodization and programming, this book is crammed full of stuff I look forward to being able to understand. By Steve Belanger RKC / Orange County,Ca. In my many years in the powerlifting game i have never come across a more comprehensive book of powerlifting information than PTTP professional. This book is not for beginners but for the lifter that has a few years under their belt, strength training with the original PTTP principles. I think this book could be also called "Beyond PTTP". Many programs and techniques from westren and Russian philosophys for advancing your bench,squat,deadlift and even press but might make your head spin with the amount of information provided. If your an information freak like i am,this book is a must have for your strength library and all for less than the price one might pay a coach/trainer to put together a PL program for you. I can't recommended it enough for the strength junkies out there. So I am sitting on my couch in my fifth week of recovery from a distal biceps tendon reattachment surgery, and my second week of recovery from acl transplant. I am wondering if dragondoor has anything new from Pavel that will assist me in designing my rehab program. I was drawn to this book. Had I read pg. 175 seven weeks ago I would still be at work and active. This book is way too advanced for me, but just like all of his other books and dvd's that my wife and I own there are some things I can use now, there are some things I wish I had been using, and there are many things I hope to grow into. Pavel you have shared many things with us from your mental database of physical training; but I don't think I am alone with this request. I WANT TO KNOW WHAT YOU DO FOR A WORKOUT, PUBLISH YOUR OWN TRAINING ROUTINE, I'll be the first one in line. With all of this knowledge, and looking the way you do, and proving with your actions that you are what you preach. What do you do daily, weekly, monthly... to be who you are. Just publish a one year training diary, no commentary, just brief explanation. That would sell. We listen to you because of who you are. Show us how to be like you. Another great book about building real strength. But heed his warning. This book is to be USED by advanced lifters but can still be enjoyed by the novice or intermediate as a "gold ring" to aim for. Great contrasts revealed between Russian and American training styles of training --"same but different". Pavel is a fount of knowledge about strength development. Rated 10/10 How do you improve on PTP and Beyond Body Building. By Rick / Mesa, Az. what can I say, Pavel did it again. I am so tired of six pack abs and all the junk out there reference building biceps etc. Pavel hits the nail on the head and he has done it again with PTP Professional. Knock off all the bull and just lift. Great reading and information packed. Pavel keeps it simple like we said in the Marines. He not only provides you info. for PL but in addition gives you alternative advice for those of us who strength train for health and other sports. I am a fan of Pavel and Marty Gallagher. A special thanks to Dragon Door for only providing the finest products and books by the best.